Charles Alexander Moore, born 06/01/1864, died 02/16/1918, was the son of John W. Moore and Delia Warren Moore. He married Fannie L. Baldwin, born 03/02/1872 and died 02/06/1960. They married on February 7, of 1886. 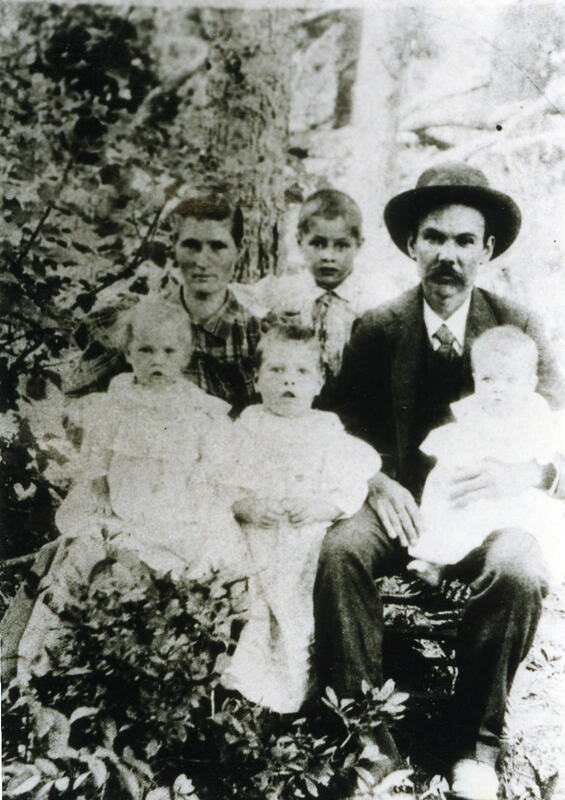 They had nine children: Arthur E. Moore, James Alfred Moore, Flarrie Moore, John E. Moore, Jessie J. Moore, George W. Moore, Rena Moore, Russell Lee Moore, and Alvin Moore. George W. Moore is their only living child. He lives on Bardstone Road in Elizabethton, KY. George married Alice Davis. He is retired from the railroad and is now self employed. Arthur was married at least 3 times. His first wife was Mattie Echols from Jasper, Marion Co., TN. They had five children: Thurman A., Lois, Margie, Pauline, and Virgil. He married his second wife Belle Lambert and they had 10 children: Doris, Cora Bell, Gertrude, Norman, Elizabeth, George, Jerry, James, Rosa Lee, and Oliver Moore. He was married the third time to a lady from Spring City, Rhea Co., TN. Arthur’s daughter, Lois, told me that he fathered 21 children. Arthur was born in 07/12/1891 and died 08/18/1969 and is buried in Hawkins Cemetery, New Salem, Lookout Mountain, Georgia. Lois married (1) Frank Gass and (2) Unknown Long. Her children are: Pat, Helen, Marie, Larry, Phil, Charles and Joan Ann Gass. Margie Moore married (1) Dave Wimberly and (2) Bill Burnette. She is buried in Chattanooga Valley Baptist Church Cemetery. Pauline Moore married (1) Mack Quarles from Jasper, Marion Co., TN and (2) Randolph Winnie. Pauline and Mack Quarles children are: Freddie, Jeanette, Geneva, and Gary Quarles. Virgil Moore married Louise Chandler and their children are Zondra, Edna, Virgil, Pamela, Audry, Frank and Willard Moore. Virgil Moore is buried in the Chattanooga Valley Baptist Church Cemetery. James Alfred Moore was born 1896 and married Mary Bell Young from Knoxville, Knox Co., TN. She was born in 1906 and died in 1960. They are buried in the National Cemetery in Knoxville, TN. He served in World War II. Their children are Geneva Moore, Charlotte Moore, William Moore and Albury Young. Flarrie Moore married Owen Gilliam. She was crippled and they had no children. Mr. Gilliam was a painter. Johnny A. Moore was born 07/13/1904. He was shot and killed by Vol Moore at the age of 20. Rena Moore married William Taylor. She was born in 1909. William died in 1947 and is buried in the Payne Cemetery in Trenton,Dade Co, GA. Rena is buried in Hawkins Cemetery, New Salem Community, Lookout Mountain, Georgia. They had 6 children: Luther, Amos, Harlan, Vonnie, Spencer and Charles Taylor. Charles, born 07/29/1930, married (1) Mary Unknown (2) Jean Horn, born 05/1930. They had 2 children: Linda Moore who married James Matney and Jerry Moore who married Vickie. Linda and James Matney’s children are Bryan and Mark Matney. Jerry and Vickie Moore’s children are Andy and Ashley Moore. Cecil Ray Moore died in 1940. He had polio. Dorothy Moore was born in 1933 and died in 1980. She married James Raleigh. They lived in Charleston, South Carolina, their children are Alien, Donna and Susan Raleigh. Betty Moore, born 1936, married Fred Alien. Russell Lee Moore married Johnnie Mae Buckles. Both are buried in Hawkins Cemetery, New Salem Community, Lookout Mountain, Georgia. Their children are: (1) Elsie Moore Fain born 08/16/1943 married Robert Fain born 12/12/1932, (2) Glenn Thomas Moore born 11/08/1946 married Anna Lytes, (3) Franklin Lamar Moore born 08/08/1952 married Becky Lyles, (4) Leroy Moore died at birth and is buried in Hawkins Cemetery, New Salem Community, Lookout Mountain, GA.
Arvie Moore was the youngest child of Charles and Fannie Moore. He was killed on the chain gang by a Stevens man from Sand Mountain. He died, in 1941. Charles and Fannie were land owners and farmers. They were hard working and upstanding people, their land was located on Lookout Mountain near the Trenton Gap. He was one of the founders of New Salem. They are buried in Hawkins Cemetery, New Salem. charles and fannie were my g-g-grandparents.their son,arthur elvis moore was my g-grandfather.it was good to see all these relatives of mine on here–growing up i never knew the moore’s in my family.it was only after i became a young man i got to know who this side of my family was. a part of this book.how do i submit them and will be able to obtain a copy once it’s published ? please let me know. I have a lot of info about the Charles and Fannie Moore family, (my great grandparents) . One of their children, Rena Moore Taylo, was my grandmother, Her daughter, Vonnie, is my mother. Verenice Hawkins- Please email me. Thnks!